Orbital ATK, along with NASA and Lockheed Martin, successfully performed a ground test firing of the launch abort motor for NASA’s Orion spacecraft’s Launch Abort System (LAS). 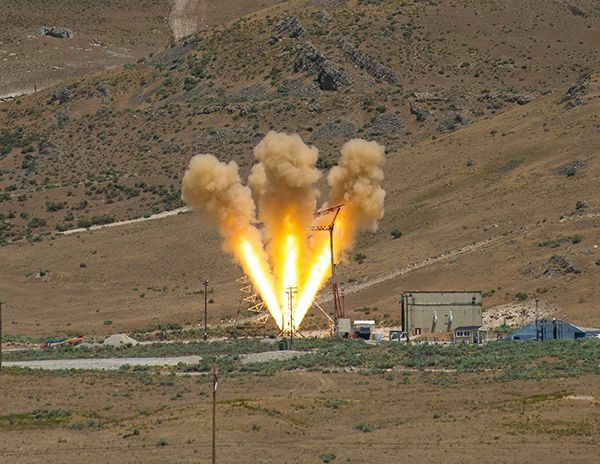 The June 15 test took place at Orbital ATK’s Promontory, Utah, facility, and was a critical milestone toward qualification of the motor that will safely pull the Orion crew module away from NASA’s Space Launch System (SLS) launch vehicle in the event of an emergency on the launch pad or during ascent. The launch abort motor for NASA's Orion spacecraft fires in its first qualification test on June 15, 2017. Orbital ATK’s 17-foot long launch abort motor sits below its four nozzles atop the Orion crew module and the 300-foot long SLS launch vehicle, ready to pull astronauts to safety during a mishap on the pad or during flight. 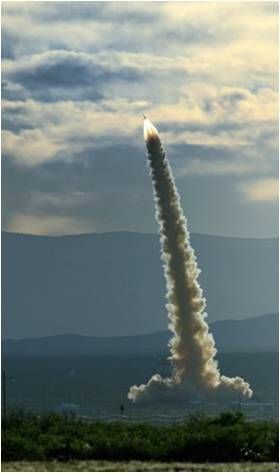 The 17-foot-long, three-foot-diameter abort motor burned out in five seconds, about three to four times faster than a typical motor of its size. This high-impulse motor was designed so most of the propellant burns within the first three seconds. This design immediately delivers the thrust needed to pull the crew module safely away from danger. As expected, the motor reached 400,000 pounds of thrust in one eighth of a second—enough thrust to lift 66 large SUVs off the ground. 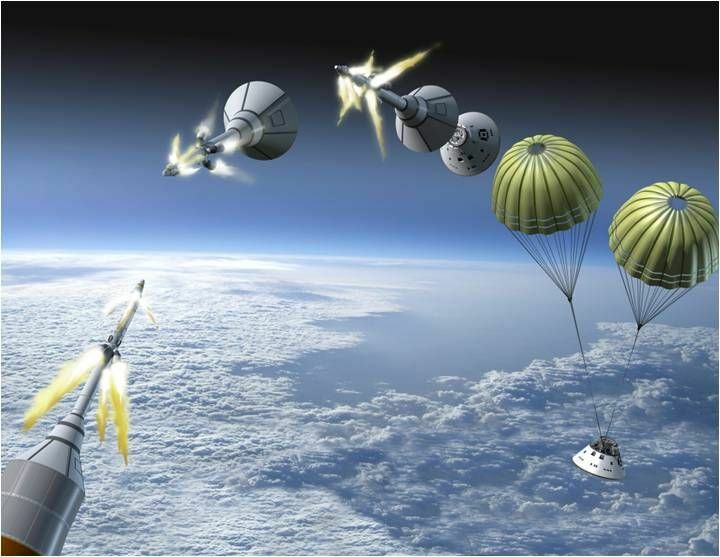 If needed during a launch mishap, the crew module would accelerate from zero to 400-500 mph in two seconds. 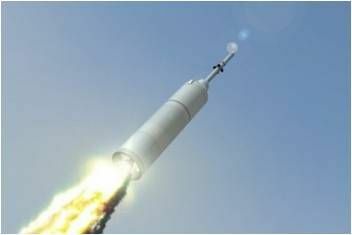 The instantaneous thrust of the launch abort motor is designed to safely transport the crew one mile away from danger in four seconds. This abort motor test, named Qualification Motor-1 (QM-1), was the culmination of a series of component tests conducted over the past few years in preparation for flight qualification. The test confirmed the motor will activate within milliseconds and perform as designed under high temperatures. More analysis will be performed in the coming weeks, but all initial test results appear to be as expected. This milestone brings Orion one step closer to its first flight atop NASA’s SLS, and eventually enabling humans to explore beyond the Moon, Mars, and other destinations beyond low-Earth orbit. Previous large-scale tests of the launch abort motor include a development motor test in 2008 and Pad Abort 1 flight test of the complete LAS in 2010. The complete LAS lifts off during the Pad Abort 1 flight test on May 6, 2010, at the White Sands Missile Range, New Mexico. Orbital ATK’s next major abort motor milestones include the QM-2 launch abort motor ground test firing scheduled for late next year in Utah, and the Ascent Abort-2 Flight Test (AA-2) scheduled to take place at Cape Canaveral Air Force Station in 2019. 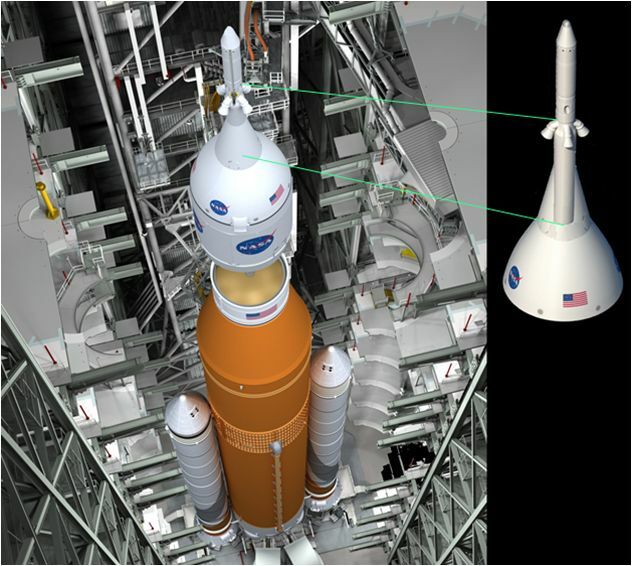 NASA’s Ascent Abort-2 test, scheduled for 2019, will demonstrate the launch abort motor’s ability to pull an Orion crew module away from an ascent test booster under the highest aerodynamic loads SLS will experience during flight. Orbital ATK is responsible for the launch abort motor through a contract to Lockheed Martin—Orion’s prime contractor. The Orion LAS program is managed out of NASA’s Langley Research Center. Orbital ATK produces the abort motor at its Magna, Utah, facility and the attitude control motor at its Elkton, Maryland, facility. The company also manufactures the composite case for the abort motor at its facility in Clearfield, Utah.